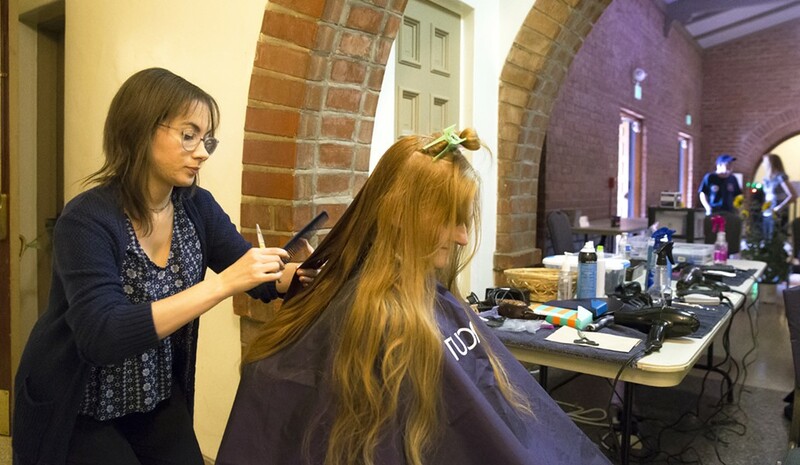 Photo By Jayson Mellom GETTING A TRIM A woman receives a complimentary haircut from Supercuts at a MASH (Mobile Assistance and Services Addressing Homelessness) event in the SLO Vets' Hall on May 24. Since "50 Now" launched in 2014, the Transitions Mental Health Association (TMHA) program that permanently houses 50 of the most vulnerable homeless individuals in San Luis Obispo County proved that it could cut clients' hospital visits in half and virtually eliminate trips to jail after one year. The successful "housing-first" program will expand in its fifth year. The SLO County Board of Supervisors voted unanimously on May 15 to add 10 beds to 50 Now in the next fiscal year, following a robust staff presentation on homelessness that outlined significant shortages in both housing and case management support for the chronically homeless. "Most of the new programs we've been able to create have been rapid re-housing programs—with the exception of 50 Now," Laurel Weir, director of homeless services for SLO County, told New Times. "There is a need to do something specifically around chronic homelessness. There's just a real shortage of permanent supportive housing for those folks." SLO County has more than 300 known chronically homeless individuals—a label loosely defined as someone who's been homeless for at least one year and has a disability. Statewide, cities and counties are moving toward a housing-first model to address chronic homelessness, which prioritizes getting roofs over heads before other services. But SLO is sorely lacking the housing infrastructure to implement that model. A recent LA Times analysis showed that SLO County has a higher rate of unsheltered homeless (about 70 percent) than the San Francisco and SanDiego areas, and about equal to LosAngeles' rate. Supervisors weighed the homeless needs with a looming budget deficit of $3.6 million for next year—which exists in part because of expensive health care reforms at the county jail—and ultimately agreed to expand 50 Now at a $106,000 price tag and leave more expensive solutions to the future. "Even in this difficult budget year, we have to make some commitment to do better than we have," 2nd District Supervisor Bruce Gibson said. Weir and the county's Homeless Services Oversight Council, made up of elected officials and service providers countywide, provided the supervisors with an extensive list of measures that could improve the landscape of homeless services. Building and acquiring more housing units for the chronically homeless is at the top of the list. The supes expressed interest in the concept of converting an existing hotel or other residential building into a homeless facility. First District Supervisor John Peschong referenced a similar project in Yolo County that's proven effective for the chronically homeless. "There's a model there for success," Peschong said. "This is a lot of money obviously, but it's something I do think is thinking outside the box." Weir's report also identified a need for more case management—specifically to replace nine case manager positions recently eliminated due to a loss in federal funding, including two to serve families fleeing from domestic violence. "There's a significant backlog of families waiting for that kind of assistance," Weir said. Funding will continue to be the key hurdle to implementation. The case managers are estimated to cost a total of $600,000 per year, while Weir's long-term recommendation of 21 more case managers came in at $1.5 million. Building up the local inventory of housing units was pegged at $300,000 to $500,000 per unit. Third District Supervisor Adam Hill said solving the funding issue is mostly a matter of the board's priorities, suggesting that the county could consider bond financing to tackle homelessness with more capital. Staff Writer Peter Johnson can be reached at pjohnson@newtimesslo.com.